Nabzatag ~ the crazy wifi bunnies we’ve been seeing for a while… apparently in the goodies section of their site they are anti-naked bunnies! Anyhow, a little random, but cute that they have pdfs for everything from paper clothes (i guess you could make them with cloth too) to stickers to decorate them (from eyebrows to mustaches to logo shirts ~ give them some character!). All you need to play with your Nabaztag and custom the Smart wifi Rabbit of Violet is on http://nabzone.com . 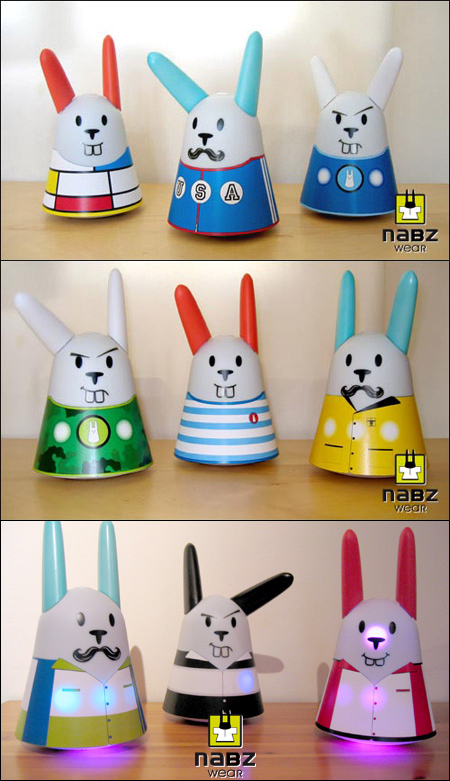 API & coding resources and samples to have fun with Nabaztag, the Wifi Rabbit created by Violet.